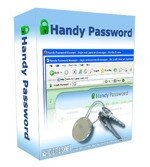 Handy Password is an easy-to-use secure password manager designed for automatic filling of web forms. You don't need to remember your passwords or save it in your browser anymore! All passwords saved with the help of internet password manager are stored locally on your computer or remotely on your email server in a single encrypted file. Now you can use your passwords on any computer where Handy Password is installed - just upload the database from your email server. Handy Password is build in IE and Firefox as a toolbar and occupies little space on the screen. To use all your passwords you have to remember just one password. With Handy Password you don't need to worry that somebody else can access your confidential information! Encrypt passwords and personal info using 128-bit encryption.